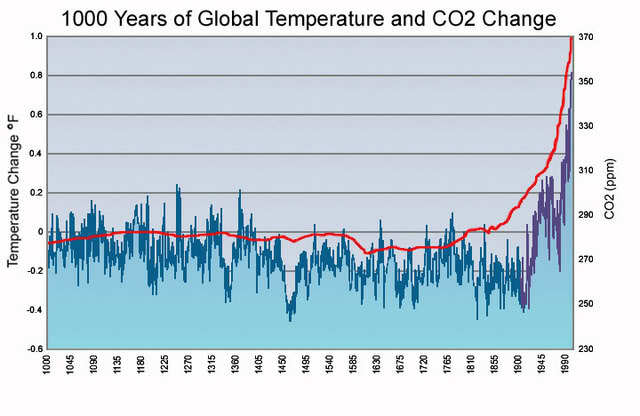 No, There Is No Global Warming “Hockey Stick” | Just Bunk! Authors note: There is so much technical science behind the issue of man-made global warming that it’s forgivable to throw your hands up and just believe whatever your favorite “expert” tells you. But it doesn’t have to be that hard. What I’ve presented below is a summary of what all that science has told us. If you want to get into the weeds on the data and statistical analysis, by all means do. The links in this post will take you there. But this is all you need to crush your favorite global warming alarmist. AGW theory is simply this: That CO2 released into the atmosphere by man since the Industrial Age has dramatically warmed the planet. The piece of evidence most frequently presented for AGW is “The Hockey Stick” graph, below. It shows that from 1000 A.D. through the 19th Century the earth’s temperature was relatively constant, until a rapid rise in the 20th century (the Industrial Age). Naturally, one must conclude that CO2 pumped into the atmosphere by modern man is dangerously warming the planet! The graph comes from a report by Michael Mann, a scientist from the Department of Geosciences at the University of Massachusetts, published in 1998. Mann’s analysis only studied the Northern Hemisphere. But the U.S. National Climate Assessment treated it as if it were a global study and released the chart above, 1000 Years of Global CO2 and Temperature Change. It was not a global study. Mann’s analysis of Northern Hemisphere temperature fluctuation was based on “proxy data” (tree ring studies, primarily). When Mann first did the analysis he weighted his proxy data evenly and found no Hockey Stick, i.e. no constant temperature between 1000 A.D. and 1900 A.D. This was discovered when researchers McIntyre and McKitrick, testing Mann’s conclusions with data provided by Mann, found a folder labeled “Censored”. This folder contained Mann’s first analysis, which Mann rejected. So, Mann went back to the drawing board – only this time weighting pieces of the data that proved AGW, sometimes 399% more than the data that didn’t, and Surprise! He got a Hockey Stick! McIntyre and McKitrick not only found that Mann manipulated the data, they also ran a scientific standard “Red Noise Test”, which uses random numbers to prove the soundness (lack of bias) of the statistical model. Mann’s analysis failed this test, too. 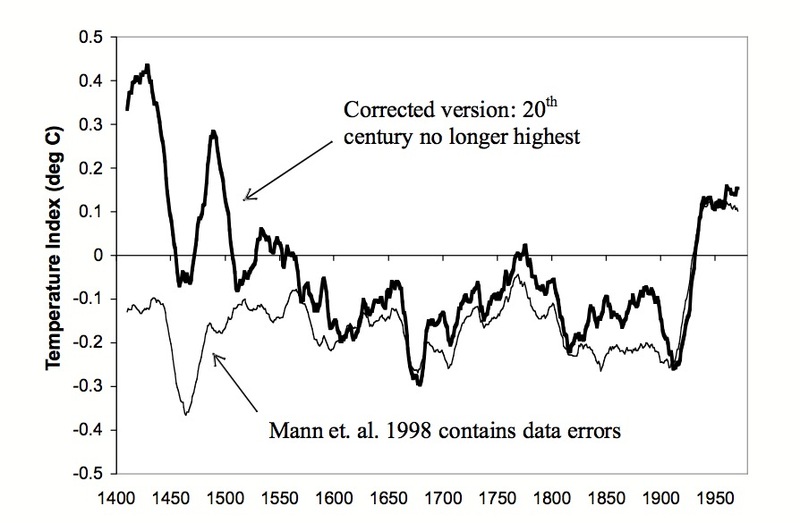 As the corrected weighting shows, not only is there no Hockey Stick, the 1400’s were significantly hotter than the modern era. There was no CO2 being pumped into the atmosphere by Industry during the 1400s. In fact, in 1990 the IPCC (The UN Intergovernmental Panel on Climate Change), the organization pushing AGW, found similar temperature fluctuations as the corrected Mann chart. The graph on the left is what the IPCC released in 1990. The graph on the right is what they released after the bogus Mann study. Notice how the Medieval Warming Period and Little Ice Age have disappeared. So, the Hockey Stick is junk science. There is no Hockey Stick. And without the Hockey Stick, there is no evidence that AGW is occurring. And … science has recently shown there is no correlation between CO2 (regardless of where it comes from) and warming of the earth’s temperature. And … science has shown that the planet hasn’t warmed in 17 years and 6 months. So what is the global warming alarmist’s response to the above? If Man-Made Global Warming isn’t real why do 97% of scientists believe in it? Wow, good point. Except that’s not true either, as I prove in No, 97% Of Scientists Do Not Believe In Global Warming. The graph, above, comparing the IPCC 1990 and 2001 temperatures comes from an excellent article detailing the whole Hockey Stick fiasco. It goes into greater detail and history, but keeps it in layman’s terms. I highly recommend you check it out. 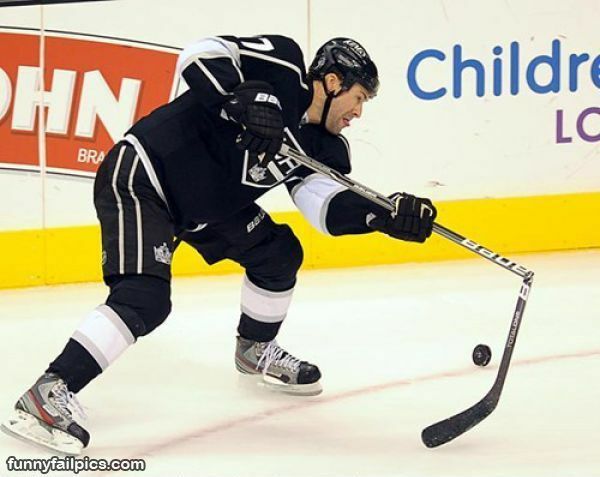 This is another great article debunking the Hockey Stick. It goes into even further detail concerning the science – and is devastating. These guys are doing a hero’s job of debunking AGW with real science. People see what they want to see, especially when it’s in their best interest. Reference Al Gore. It’s hard to accept statistical fact when your making a big paycheck off an illusion.